Myelofibrosis with myeloid metaplasia is presented with signs and symptoms such as massive enlargement of the spleen/splenomegaly, felling tired, fatigue and pallor. 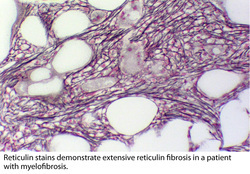 Myelofibrosis with myeloid metaplasia is treated with transplant of the bone marrow. Myelofibrosis with metaplasia of the myeloid is mostly occur due to fibroplastic proliferation in the bone marrow as a result of increased in secretion of platelet derive growth factor and transforming the beta growth factor. There will also be a decreased in the level of hematocrit. Pathologically, myelofibrosis with metaplasia of the myeloid may present with loss of bone marrow which stimulates extramedullary hematopoiesis. This commonly occur in the liver and the spleen. The cavity of bone marrow will be replaced with fibrous tissue. There will be an increased with megakaryocytes with a loss of the hematopoietic precursor cell. There will be thrombocytosis with platelet that is abnormal in structure. Besides that the red blood cell may be nucleated. There will be a granulocytes precursor cell and teardrop shaped erythrocytes. 1. PITCOCK, JAMES A., EDWARD H. REINHARD, BERTRAM W. JUSTUS, and ROBERT S. MENDELSOHN. “A Clinical and Pathological Study of Seventy Cases of Myelofibrosis.” Annals of Internal Medicine 57, no. 1 (July 1, 1962): 73–84. doi:10.7326/0003-4819-57-1-73. 2.Tefferi, Ayalew. “Myelofibrosis with Myeloid Metaplasia.” New England Journal of Medicine 342, no. 17 (2000): 1255–1265. doi:10.1056/NEJM200004273421706.